Box 1231, 250 Sovereign Lake Rd. 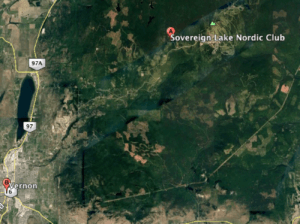 Sovereign Lake Nordic Club is located 22km east of the City of Vernon, BC up SilverStar Road. Just 2km west of SilverStar Mountain Resort. Signage is located on Hwy 6 as well as on Hwy 97 directing you towards both SLNC and SilverStar.